Spain now has one of the best rail systems in Europe. 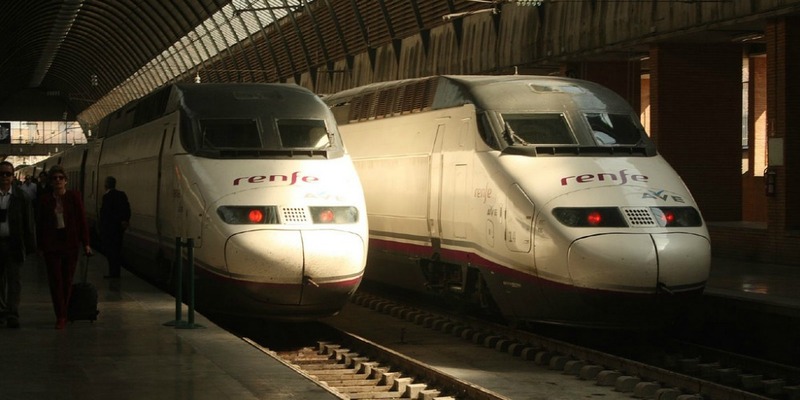 Run by Renfe, the fabulous Alta Velocidad España (AVE) long and mid-distance trains travel at up to 186mph and link all major cities and towns in Spain. Click the red links for more information on train travel to and from Granada. Spain is linked by the international rail network to Portugal, France, Switzerland and Italy. European train travel options include the Elipsos train hotel (Paris-Madrid or Paris-Barcelona), or various passes such as the InterRail and Eurail. The Renfe national rail network links Granada with and a number of cities in Andalucía and beyond including Almeria, Algeciras, Antequera, Guadalajara, Barcelona, Malaga, Valencia, Sevilla, Zaragoza and Madrid (via Linares-Baeza, Jaén). Although there are some trains serving provincial towns such as Guadix and Loja the local network is not extensive and bus travel is a better option. You can take the LAC bus route from Gran Via to Avenida de la Constitución. It is a short walk from there to the Station. There you will find a cafe, left luggage, and tourist and car hire information. Tickets can be bought in person at the ticket office of any Renfe station but if you book at least 15 days in advance online at www.renfe.com you can make some great savings on fares which you will not find anywhere else. You can book tickets up to 60 days in advance on any long-distance journey within Spain and print your ticket at home. If you prefer you can also buy tickets online with Spanish Railway’s UK agent or by phone on +44 (0)20 3137 4464. A booking fee applies and you will not find the same discounts as are available on the Renfe site. This is a Spanish rail pass available to non-residents traveling around Spain on all AVE Long-Distance and Mid-Distance high-speed trains. It is active for six months from the date of issue and is valid for one month from the date on which it is first used for a journey. You can travel Business/Club class or Tourist class choosing from four, six, eight, ten or twelve journeys. You can find more details and purchase the Renfe Spain Pass here. On the other end of the scale there is Tren Al-Andalus. This is a six day luxury train tour of Andalucia that begins and ends in Sevilla. This Palace on rails takes you to Cadiz, Jerez, Ronda, Granda, Linares-Baeza and Cordoba. On your travels you will enjoy such delights as wine tasting, Andalucían dancing horses, Flamenco, and a visit to the Alhambra.